NOTE: This post was written by Renata Koch Alvarenga. Renata is a freshman at the School of Diplomacy and International Relations. She is from the South of Brazil and speaks Portuguese, English and Spanish fluently. Renata is the Under Secretary-General for Programming at the United Nations Association –Seton Hall University chapter and and class representative of the French Club at Seton Hall. She is also a national articulator of the youth organization Engajamundo in Brazil, helping to empower young people in international negotiations regarding gender, sustainable development, and climate change. Renata is passionate about global affairs and has been involved in Model United Nations for a long time. She is pictured on the front page of the blog with Ambassador Antonio Patriota, Permanent Representative of Brazil to the UN. 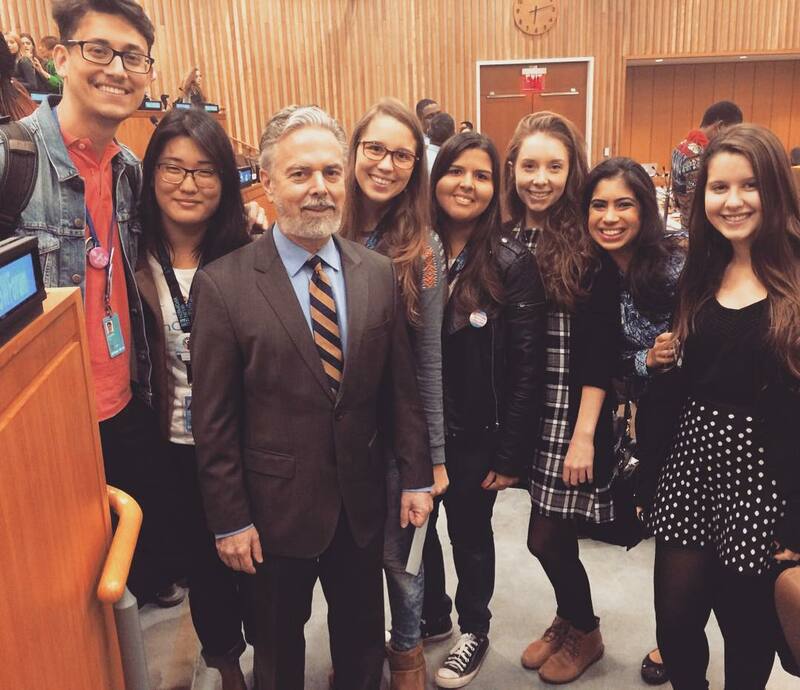 The Commission on the Status of Women is in its sixtieth session in 2016, however, the CSW60 Youth Forum, which took place in the United Nations Headquarters between the 11th and 12th of March, was the first forum dedicated for the youth of CSW, ever! Naturally, the Youth Forum brought together youth from all over the world, uniting forces to draft the CSW Youth Declaration. This document was produced with the help of youth and then introduced to Brazilian Ambassador Antonio de Aguiar Patriota, Chair of the 60th session of CSW. I was fortunate enough to attend the second day of the CSW Youth Forum, in which I spent the entire day going from one conference room to another in order to participate in different working groups and discuss the youth priorities on gender issues. Given my interest in climate change, I decided to take part in a working group about Climate Change and Gender, a theme that is not usually discussed, but it is crucial for the successful achievement of the Sustainable Development Goals, the priority theme of this year’s conference. The discussion titled “Youth-Led Action for Solutions on Climate Change and Gender Equality”, included renowned panelists, such as Steve Lee, the Founding Executive Director of the Foundation for Environmental Stewardship, Juan Chebly, Lead Adviser of the United Nations Environmental Programme and Ralien Bekkers, who was the official Dutch Youth Representative on Sustainable Development to the United Nations and is now at Yale University studying Environmental Management. Last December, I attended COP21 in Paris (United Nations Climate Conference) as a youth representative in the delegation of Brazil. Therefore, getting the chance to hear these climate change activists and their stories made me even more inspired and eager to continue my work on climate justice. In this panel, I truly felt that my voice as youth was heard, and that my concerns regarding the future generations were understood by decision-makers. Besides this working group, there were various other topics related to gender, which called upon young people to reflect on the broadness of the issue and learn how to act on it. Gender and sports and gender equality and faith were some of the other panels that helped build the final Youth Declaration. After spending the entire day at the United Nations, hearing and meeting inspiring females, who have faced many struggles in their lives and were able to succeed in their fields and represent the fierceness of girls and women, I got empowered. These events are important to make sure that the voice of the current and future generations is heard, and I am glad I could represent myself and stand up for my thoughts on gender equality, instead of just being on the other side, watching. The CSW Youth Forum was remarkable and will, undoubtedly, have a great impact on the outcome of CSW60, set to end on March 24th.